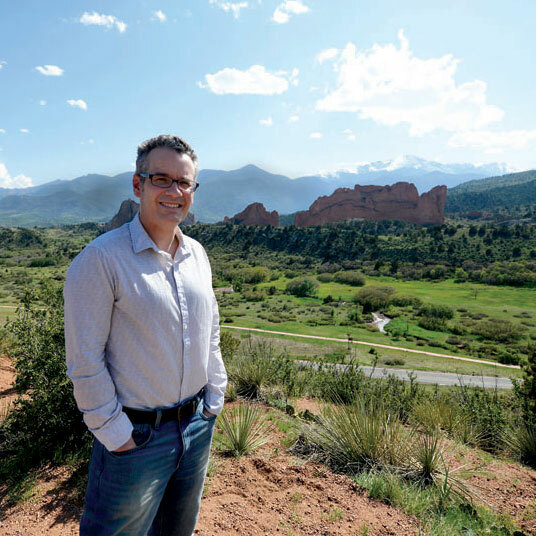 Joining Colorado College in 2005 was a “no brainer” decision, he said, one made easier by his passion for the Southwest, which he first discovered while at Mary Washington College (’92). Following his master’s at Louisiana State University where he worked on a sustainable agriculture project at Zuni Pueblo in New Mexico, and Ph.D. from the University of Texas at Austin, where he examined private cattle ranching in northern Mexico, Perramond was determined to bring his work and passion to their natural coalescence — the Southwest, and to Colorado. During his time here, Perramond says that “CC has changed far more radically than I have!” – particularly with emphasis on the diversity of students he now teaches. “We’re constantly forced to consider how we make our materials relevant and interesting to a constantly growing and changing student body,” he said. Beyond the classroom and the field, Perramond likes to get outside “as much as possible,” cooking, and all things wine-related.